Daily Illuminator: GURPS Reprint Bundle Available Until May 7! May 2, 2017: GURPS Reprint Bundle Available Until May 7! Due to the success of our recently released GURPS On Demand line, featuring eight hard-to-find books available again in print through CreateSpace, we're offering a new bundle to get RPG fans all the loot, plus more! 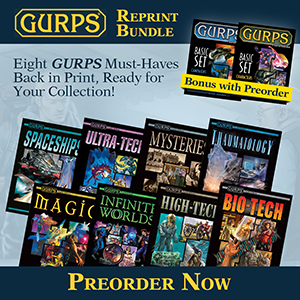 Available until Sunday, May 7, the GURPS Reprint Bundle is a limited-time offer that includes all of the On Demand line, comprising highly regarded books that were, until now, tough to track down. The bundle includes all eight books: classics ranging from the interstellar with GURPS Spaceships, to fantasy with GURPS Magic, and everything in between! You'll also get a bonus copy of the GURPS Basic Set: Campaigns and Characters. That's ten books, more than enough to get started in GURPS or expand your existing collection. It's perfect to stock the shelves of your local game store, as well! Retailers, simply use your store's Warehouse 23 account or contact our Retail Liaison for more about setting that up. We're excited to be able to offer these fan-favorites in print again, and we hope you enjoy them. Look for more books in the future, and remember to order your GURPS Reprint Bundle by this Sunday, May 7!